Xeikon, which has built its business on toner technology, has announced a sudden move into inkjet printing with a UV ink system under the Panther brand name. 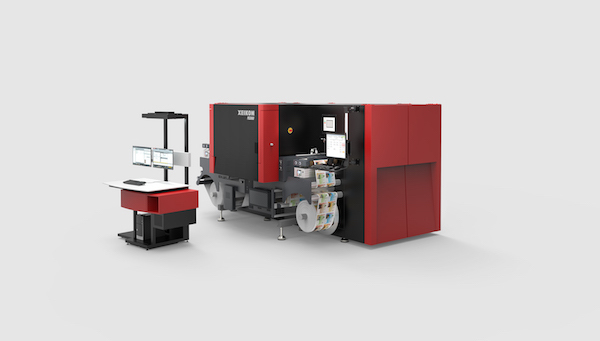 Xeikon has launched a new UV inkjet label press, the PX3000. The first product will be a new label press, the PX3000. Jeroen Van Bauwel, Xeikon’s Director Product Management explained: “The Xeikon PX3000 based on our newly developed Panther UV inkjet technology and operating PantherCure UV ink, is engineered with the requirements of the label market and its end-users in mind.” The PX3000 has a web width of 330mm and a maximum speed of 50 m/min. It prints CMYK plus white with 600×600 dpi resolution. It prints to a range of substrates including self-adhesive media with facestocks including paper, PVC, PP, PET and PE. It will use the same X-800 front end as Xeikon’s other presses.